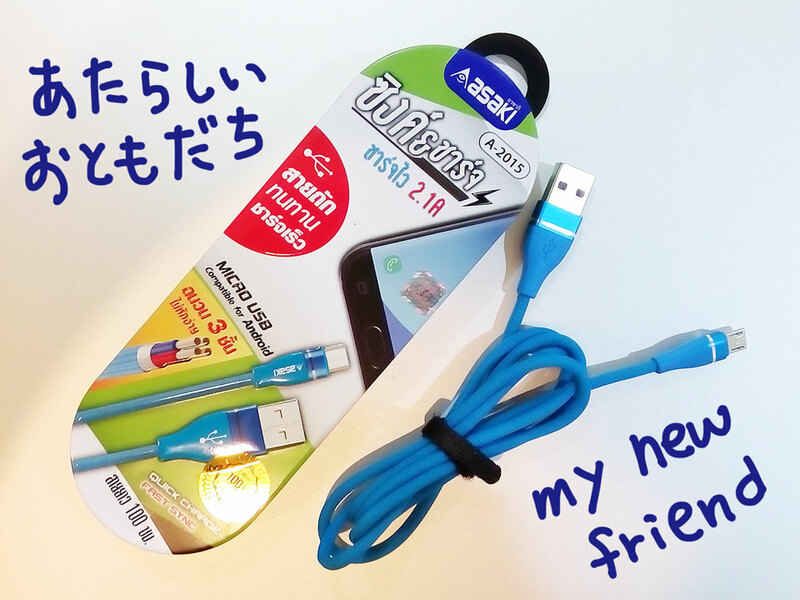 どうやって買うか / The problem is how to buy the USB cable. A battery of my smartphone had lasted for one week after I arrived in Bangkok. When the smartphone gave me a warning about the battery, I took action. タイでマイクロUSBを手に入れる方法 / Getting a USB cable in Bangkok. However, the problem was how to buy it. An apartment I will stay at is located in a big city, but there are no electronics retail stores nearby. How about buying it in a net shop? → I didn’t have a SIM card, couldn’t use my phone. How about going to electronics stores by taking a metro? → I didn’t have cash, I couldn’t take a metro. あっと驚く賢者の意見 / A surprising advice by a host. I asked my host for some advice about where could I buy it. She said that a seven-eleven had. It was the easiest way to buy!! Then I got a new travel friend, a blue one.